Since 2011, conflict and related violence in Syria have caused the deaths of over 400,000 people, widespread injury, destruction and human rights violations, as well as a complex displacement crisis. As of late 2018, more than 5.5 million registered Syrian refugees are living in Turkey, Lebanon, Jordan and Iraq. Over a million Syrians have sought refuge in North African countries, the EU and elsewhere. In addition, more than 6.5 million Syrians are internally displaced. Not all Syrians and stateless people who have fled Syria, nor all internally displaced people (IDPs), are registered, therefore the true numbers are even higher. But what effects have the Syrian conflict and displacement had on human trafficking? With the Targeting Vulnerabilities study, ICMPD sought to answer this question, and contribute to filling the research gap on trafficking, conflict and displacement, with a particular focus on Syria. The methodology was able to capture many aspects of the effects of the conflict and displacement on trafficking, as well as on vulnerabilities to trafficking. We were able to reach important conclusions, some specific to this particular conflict and displacement crisis, and others more general. The research found that people are often trafficked or exploited because they are not able to meet their basic needs. This is exacerbated by complications in relation to legal residence status and legal authorization to work in host countries. While some trafficking is committed by highly organized criminal networks, the most common type of exploitation is at a lower level, involving fathers, mothers, husbands, extended family, acquaintances and neighbours. The context of general vulnerability means that there are often factors that leave families with no viable alternative for survival other than situations that could be defined as exploitation and trafficking in national and international law. The research that ICMPD carried out in 2015 covered Syria, Turkey, Lebanon, Jordan and Iraq. The lack of statistics meant that we had to rely on predominantly qualitative methods and analysis. To understand the effects of the war, we considered the decade prior to the outbreak of the conflict as the “baseline period”, and then compared the results of research on the period 2011-2015 – the “impact period”. The conflict and displacement were therefore considered, together, as the relevant dependent variable. It was a necessarily imperfect approach; a rough-and-ready attribution of all changes in trafficking trends since 2011 to the conflict and displacement. Because the effects of the war have been far-reaching and catastrophic, and because the subjects of the research were people affected by the conflict and displacement, we assessed that the dependent variable was explanatory in a general sense. Conducting qualitative research is crucial in improving the effectiveness of the humanitarian response and ensuring better protection from rights violations. We used an interdisciplinary methodology, applying methods from various social science disciplines, depending on what was necessary to answer the research question, including sociology, law, demography, anthropology and political science. Five country researchers conducted desk research, taking into account the relative reliability of different sources according to whether they were based on empirical research, analysis of official data or other methods. We complemented this with field research with interviews with key informants, who were selected for their connection to the research topic, including people working with international organizations, national and local state authorities, international, national and local NGOs and humanitarian organizations, journalists and other media sources, researchers and other interlocutors identified as having relevant information. Semi-structured interviews were conducted, applying the principle of informed consent and according to a standard set of interview guidelines covering the main topics of the research. However, we adapted the topics during each interview to the specific expertise and experience of the informant. We did not necessarily expect a high level of understanding of the topics among the informants, but instead probed them for relevant information, according to what we understood as the working definitions, rather than the informants’ own understandings. In order to address the logistical difficulties of conducting field research in conflict zones, we also conducted interviews over the phone, on Skype and through email exchanges, as well as in person. There was flexibility in terms of topics covered, mode of interview and level of anonymity which was necessary because the objective of the interviews was not to have standardized, comparable information about informants’ attitudes, but rather to gather as much information as possible that was relevant to the research question. It allowed for a higher number of informants to participate in the research, and was essential for Syria in particular, as most interviewees there requested to remain anonymous to ensure their own personal safety. 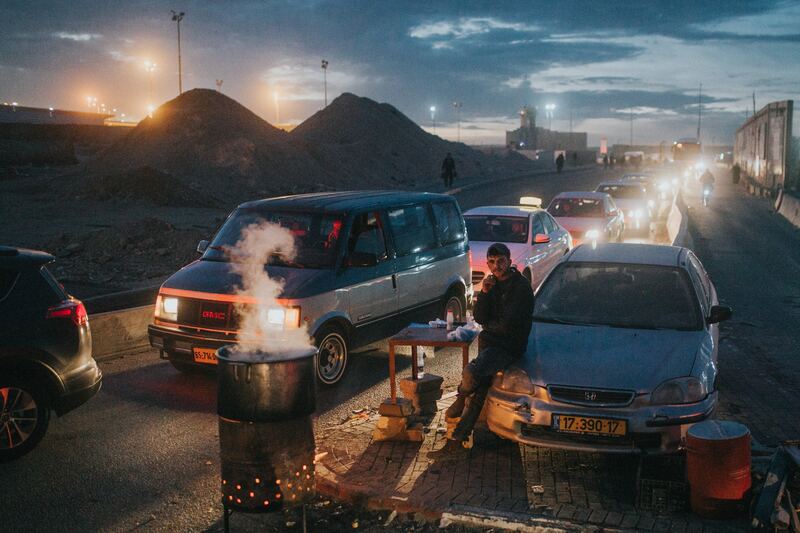 A man waiting by lines of cars going through a checkpoint from Ramallah, Palestine to enter Israel. Unsplash/Cole Keister. We relied heavily on observational research, using an inductive approach – letting the research field speak for itself, as much as possible, rather than imposing artificial constructs and structures by applying an overly rigid methodology. Primary field research continued until the point of theoretical saturation was reached, meaning that no more relevant new information was being obtained through interviews and consultations. Finally, triangulation was applied, in order to cross-reference, compare and contrast findings from different sources, and findings obtained through different methods. Triangulation seeks to verify the validity of information, as well as to approach the research question from different perspectives. Attempts were also made to search for disconfirming evidence, rather than trying to obtain only additional information that confirmed what was gained from existing sources. In addition, although publicly funded qualitative research projects for policy audiences are not generally subject to academic review, in order to ensure the validity of the methodology and the analysis—and the potential impact of the research—a peer review system was designed and applied. Nevertheless, there are some caveats in understanding the findings. The methodological design of the research was necessarily limiting – for example, the decision not to conduct interviews directly with affected people, due to logistical difficulties and the challenge of obtaining a representative sample. Other limitations of the research related to the obstacles posed by the research field itself, such as the ongoing conflict. Conducting such qualitative research is crucial in improving the effectiveness of the humanitarian response and ensuring better protection from rights violations. However, such research has rarely been conducted, particularly while a conflict is still under way. The challenges of researching the subject of trafficking and conflict and the exigencies of conducting research while conflict and displacement are ongoing should not discourage similar endeavours, as the communication of research findings on this topic to the policy community is essential if we are to respond effectively and protect vulnerable people. Dr Claire Healy is Trafficking Research Coordinator for ICMPD’s Anti-Trafficking Programme (follow us on Twitter @ICMPD_THB) and the author of Targeting Vulnerabilities: The Impact of the Syrian War and Refugee Situation on Trafficking in Persons. She is currently coordinating research on trafficking resilience and vulnerability on overland and sea migration routes to the EU (STRIVE), to be published in early 2019, and has been working with the Economic Community of West African States (ECOWAS) Commission on anti-trafficking reporting and policy since 2014. This article has been prepared by Claire Healy as a contributor to Delta 8.7. As provided for in the Terms and Conditions of Use of Delta 8.7, the opinions expressed in this article are those of the author and do not necessarily reflect those of UNU or its partners.